A few weeks ago I mentioned the saga of my Panasonic DMR EX75 DVD recorder with the dodgy DVD drive was eventually resolved. Long story short - after many comings and goings Panasonic supplied a new drive free of charge though earlier repairs diagnosis by the local Panasonic approved repair centre, J.F. Associates, amounted to just under £120. Ok then the machine starts playing up again, this time refusing to record properly or even pick up the digital freeview signal. I followed up on the initial suspicion of a problem with digital TV transmitter in Oxford. But the website continued to say there are no problems with the TV signal. The question was should I go back to J.F. Associates for another £58.75 diagnosis or take the lid off and have a quick look for any obvious problems in the innards myself? Many years ago, when working with a great bunch of people in industry (now GKN then Lucas Aerospace), I spent quite a few years building and operating bespoke flight simulation rigs and testing aircraft parts to destruction with them (great fun). So spotting a dodgy resister or two shouldn't be beyond me and any further subtantial spending on this box of electronic tricks is pretty much geting beyond the point of diminishing returns. Lifting the lid was fairly straightforward though the green PCB had to be disconnected and carefully removed too before finding the problem in the main board immediately below it. As it turns out it wasn't a blown resister but a blown capacitor and sure enough a quick Google search throws up an extremely helpful thread from AVForums demonstrating a number of other people have had precisely the same problem. 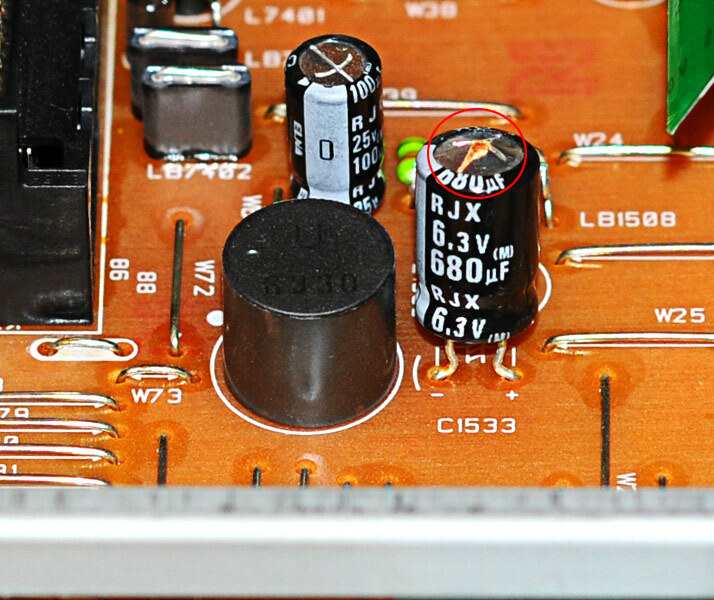 Over-stressed capacitors, it seems, are a common cause of failure. I hope they won't mind me posting their images here (all three are from the forum). 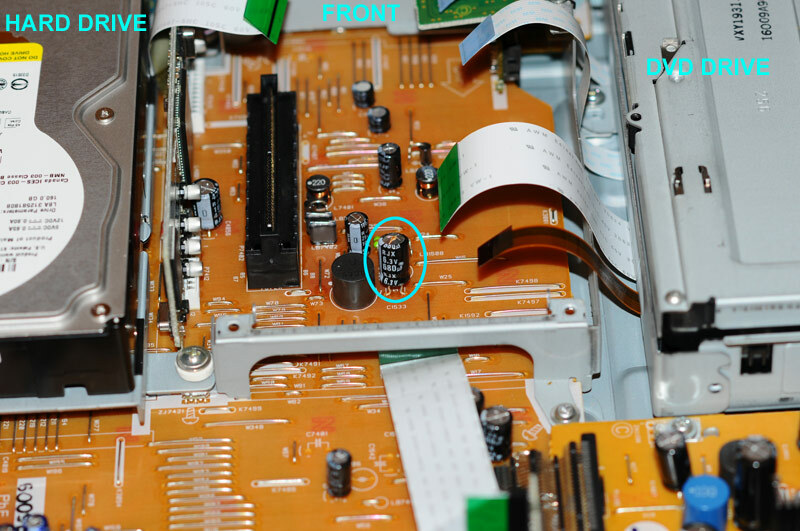 My capacitor wasn't quite as badly domed as the one in these photos but it was pretty clearly out of commission. In any case I sourced a replacement capacitor from Charles Hyde & Son for £1.02 and since I didn't possess a soldering iron, not having wielded one in anger for some years, got one of those too. Farnell sold a usable alternative capacitor for £0.22 but needed a minimum order of £20. Snipping off the busted capacitor and replacing it sorted out the signal problem and actually improved the quality of the freeview reception on the machine which had been deteriorating for some time. 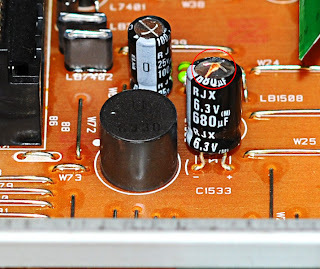 Just one extra thing to note on top of the extremely useful practical advice on the forum - if you're thinking of tackling something like this, be sure to snip the legs of the capacitor quite high up, so that you have a solid base to crimp the legs of the new capacitor to before soldering. 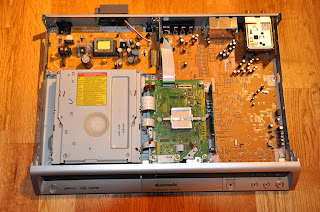 "Unfortunately circuit analysis down to this level virtually does not happen any more in servicing such that I was shocked to discover yesterday, when I looked into this particular capacitor, that Panasonic do not even provide component values in the service manual"
I wonder how many serviceable pieces of electronic kit get binned each year due to busted replacable simple components? One of the many costs of lock in (can't service yourself or you'll invalidate the warranty), commercial efficiency drives for economies of scale, commodification and de-skilling. Now there is a postscript to the story of my apparently healthy again Panasonic DVD/HD recorder. The freeview signal is fine and I can safely view and record to the hard drive again. However the DRM has gots it's knickers in a twist and won't let the machine read my DVDs! The machine with the brand new DVD drive doesn't approve of my DVDs. Don't let me get started on DRM... but if anyone on the interweb has a simple quickfix I'd be happy to hear from you.